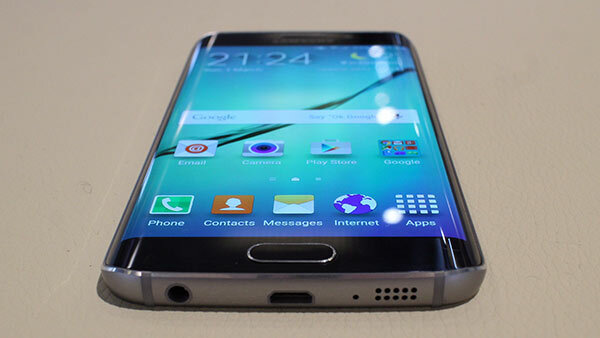 The Samsung Galaxy S6 Edge comes in with the regular S 5.1 inch metal screen but also has rounded glass right on the right and left sides, giving this smartphone its name. These 2 curved screen portions will form symmetrical ridges, offering a stylish bubble effect. However, it is not style why you will love these 2 curves. At first glance, nothing looks too special. We are faced with a unique shape but this is something that a lot of smartphone manufacturers tried till now, without a lot of success or without any success. With Samsung, most of the innovations are successful so it should come as no surprise to anyone that the very first thing you will notice is that the smartphone does feel quite comfortable while using it. The only real problem is that when you use a case, you will not be able to take advantage of the extra features that appear because of these 2 curves. You can use these curves in order to get some interesting notifications while the device is simply placed on the table. At the same time it allows you to easily navigate through the menu, no matter the position the device is placed in, which is definitely interesting to notice. When compared with the regular Samsung Galaxy S and its rectangular shape, the Edge model obviously steps in as a breath of fresh air since it is chic and modern in design. Note Edge does feel similar to this smartphone but the Edge does look a lot better. Aesthetics do count at the end of the day. Whether or not you are willing to pay the extra amount is something that you will have to decide. However, the upgrade is quite obvious in terms of snapped picture quality and feel when using it.